As the school year drew to a close in June 2013, Paul Public Charter School in Washington, D.C., was selected by ABC Channel 7 television personality Leon Harris as one of “Harris’ Heroes” for the difference they are making in their community. Harris recognized the students as heroes and honored Project Learning Tree “for its work in giving youth an active voice” and for getting students outdoors and connecting them with their environment. Watch this two-minute video on WJLA’s website. These urban middle-school students have transformed their asphalt schoolyard into a thriving urban garden. 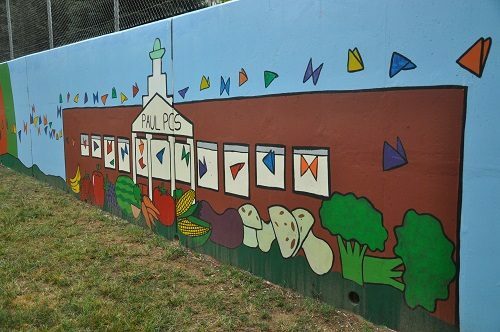 They have turned an eyesore of a bare, street-facing wall into a huge, brightly colored environmental mural that has helped bring the school and the neighborhood together. And they have worked to implement energy- and water-conservation and recycling programs to reduce their school’s carbon footprint. An immense wall used to be a huge, rusty cement eye sore, but there was no shortage of ideas from the kids about how to transform this corner of their school. They researched murals in D.C. and their impact on neighborhoods. They combined photos taken around the city with interviews of students and community members to develop a proposal for a mural with an eco-theme “D.C. is Going Green” that won the approval of school administration, community board members, and funders. Inspired by muralists Hector Durate and Ellen Griesedieck, students created the design—an “eco-wave” washing over the school and Washington skyline. The mural depicts flowers, leaves, and butterflies, an environmentally friendly school bus, silhouettes of the kids doing a cartwheel, and outlines of their handprints. Students concluded that if the mural had a positive message about the environment, people would be more likely to clean up after themselves and not throw trash on the ground. Howard University student and artist Michele Goosby worked with the students to bring the wall to life. She enhanced the design by making a tree with the recycling sign for its foliage as its central point and added more fruits and vegetables to represent the school yard garden students had also worked hard to create. More than 20 student volunteers regularly continued to come even two weeks into summer vacation to finish the mural. After three weeks, dozens of gallons of paint, oodles of paint brushes, and several trips to ACE Hardware, it was completed. The mural was truly a collaborative process that involved teachers, students, and community members. Despite the heat, the gnats, and the labor, the passersby who honked their horns and yelled out good wishes of “looking good!” and “way to go!” made it all worth it. See more photos of the mural on PLT’s Facebook page. Most of the school’s Green Team projects have focused on getting students outdoors, working on the gardens they have created. The garden project started when I returned from an environmental education Peace Corps experience in Nicaragua and realized that my students in the U.S., all English Language Learners, could benefit from hands-on work with the environment. A Project Learning Tree GreenWorks! grant provided the materials I needed to create several raised beds where the students now grow food that includes tomatoes, jalapenos, lettuce, corn, basil, and cilantro. Master gardener and chef, Mark Haskell, has helped the students realize the nutritious—and delicious—results of the time they spend digging in the dirt. We use the bounty for special occasions to make salads for our visitors. These have included officials from the U.S. Department of Education and the U.S. Forest Service. For Earth Day 2013, students created a new pollinator garden, bordered by an intricate stone walkway designed by a student. They worked for eight hours on the day before Earth Day to lay 4,000 pounds of stone; plant coneflowers, goldenrod, sunflowers, geraniums, and pepper bushes; and put up brightly-painted nest boxes for non-stinging bees to pollinate the flowers. We had been studying pollination in class since January, so this was a perfect project. It also taught teamwork and cooperation. The student who had the idea for the walkway had the design in her head. She trained other kids to lay the path because she couldn’t do it all herself. She also trained volunteers to help get it done. In addition, to help reduce their school’s carbon footprint and save water, students installed motion detectors for the lights in the school’s hallways and bathrooms, and encouraged school administrators to install automatic flushing mechanisms on toilets and motion sensors on bathroom faucets. They plan to look for even more ways to save energy and water when the school is remodeled. Paul’s Green Team uses three composters purchased with help from a GreenWorks! grant to compost leaves and other vegetable waste from the raised-bed gardens into soil for the new pollinator garden. They compost waste from the school’s cafeteria to create even more of the rich gardening soil for their outdoor projects. They have also purchased recycling bins for the school to keep cans and bottles out of the stream of trash the school sends to the landfill. Believe in your students’ problem-solving abilities. The most important thing is to make sure your students are invested in every project. They’ll be invested if they see a project as their idea, not their teacher’s. If your students are having trouble thinking of project ideas, try brainstorming, or suggest they interview people in the community to see what they can do to improve their neighborhood. Never say no. No matter how big the students’ dreams are, they can be realized. Our mural is a good example. My students put together a presentation of murals in different places in D.C. and interviewed people about how those other murals had made a difference in their community. Those interviews, and writing letters and proposals for our own mural helped my students develop language and social studies skills. When they see that what they’re doing is making a difference in their community, they’re motivated. Trust your students to make decisions that are going to benefit the community. Encourage students who are not natural leaders into other leadership roles. Sometimes you need to be a little crafty to encourage students who may not shine in other areas to do something different that will give them the confidence they need. I am confident that my students will continue to accomplish great things. “We really care about each other and the environment, we’re like family trying to change everything,” 13-year-old Eleni Hailu told the Channel 7 news crew. “I’m so proud of us, I can’t wait to see what we do in the future,” added eighth-grader Nanci Reyes. Watch this YouTube video and hear from the students at Paul Public Charter School about how they are greening their school. Apply for a PLT GreenWorks! grant and help students improve the environment at their school and in their neighborhood. Every year PLT awards GreenWorks! grants to schools and organizations for environmental service-learning projects. Read about some of the outstanding school garden projects completed last year. Tips for involving students in a green schools program from teachers at Two Rivers Magnet Middle School in East Hartford, CT.